Did you know that the amounts you can contribute to your IRA, Roth IRA, SEP, SIMPLE or 401(k) will increase starting January 1, 2019? 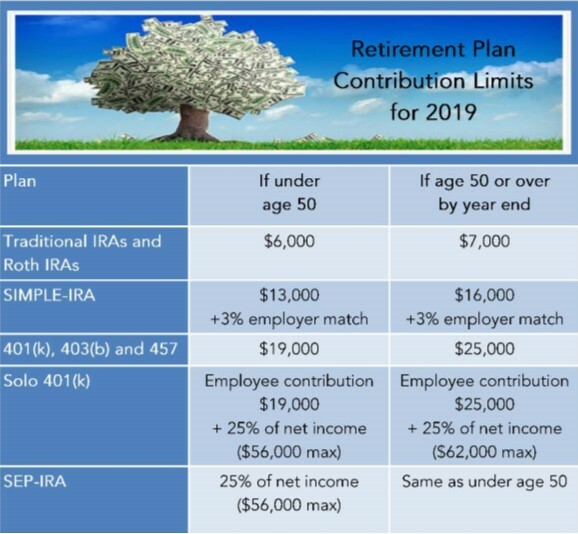 If you make periodic payroll or monthly contributions to your retirement accounts, you’ll need to adjust your savings amount before January 1, 2019 to reflect the higher limits. The Takeaway: Longer life spans and potentially lower investment returns mean you need to save more to cover your retirement needs. The exact amount you should be saving depends on your age and spending needs, but a good rule of thumb is to save at least 10% to 15% of your pre-tax income each year. Your CFP® advisor can help keep you on the right path. ← Join Us For Our Holiday Open House, Thursday, December 13!